We all know that saying “Don’t judge a book by its cover.” We hear it all the time. But, we rarely hear it applied to actual books. 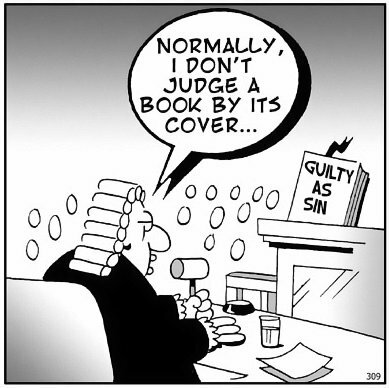 That is because we all judge our books by the cover. Phineas: Yeah, it looked way outside, but then it was right in the zone. There’s a lesson, baseball fans: never judge a book by its cover. Candace: Boring, dull, stupid, lame— heavy-handed and derivative. Linda: Oh, thank you for those insightful reviews of books you haven’t read. Candace: Mom, that’s why books have covers: to judge them. I mean, why did you choose these books from the library? Every time I see that scene (and I watch a lot of Phineas and Ferb) it makes me smile. Because it is so true. Books have covers to entice us to buy them. When I am in the book store (yes they still have those,) I browse the rows of books until I see a cover that jumps out at me. I pick it up, look it over (including the back) and I decide if I am going to buy it based solely on the cover. This is why cover art is so important. Once you get them to pick up the book, you need to get them to turn it over and read that all important “sales pitch” printed on the back. Only after you get past that will you be able to get them to buy the book. Even if the person thumbs through the first few pages, they have to pick it up off the shelf first. That is why covers are important in the store, but what about online. Do people still browse the virtual aisles of Amazon.com? I think they might. Even if they know exactly what they are looking for, they may browse more. For example, go to Amazon.com and search Richard Flores IV… no wait that sounds vain, search Robert S. Wilson instead. If you were specifically looking for his book Shining in Crimson because you saw my post about it (vanity again). How would you recognize it instantly in the scrolling list of results. THE COVER. Now, if you click on the link to his novel. You will see Amazon puts that “People who viewed this also viewed:” on the bottom. Now all you see there is the cover, the title, and the author. Now, you may not ever use that (I have), but people do that. Otherwise, Amazon wouldn’t use it. Again, they will make the choice to click on the novel, based on the cover. So the cover is important in store or online. If you go with a big publisher, chances are they will have someone take care of the cover art for you. But, if you decide to self publish you will need to deal with cover art on your own. Perhaps you hire somebody, or you can do it yourself if you choose. But be prepared to spend some time on it. To have the title on it. That seems obvious enough, but the title should be the dominate text on the cover. I have seen books where you could easily mistake the Authors name as the Title. Or even a tag line. You don’t need to place the Title on top, but you do need to make it the most eye catching thing on there. Use easy to read, but stand out fonts. Make sure the title contrasts with the rest of the cover art, you don’t want it getting lost in the artwork. To have the Author’s name on it. Believe it or not, I have seen covers with no Author’s name on it. If I want to find a book by Robert S. Wilson, Lee Gimenez, or even a blockbuster like Orson Scott Card; you need to have the name on it. I am not going to spend time looking to see who the book is written by. You may not think you are worth looking for, but if you are marketing your book, someone is looking. Even me, the twice published author of two short stories, gets a hit to this site based on a search for my name, an average of once a week. Again, stand out font that contrasts with the artwork. The artwork itself. Many would argue this should have been number 1 on this list. Sure the art may be what catches the eye first, but title is what always hooks me in to reading more. So as far as importance goes, you decide. There are several ways to get artwork for your cover. There are plenty of stock photo/artwork sites. You can buy the artwork per piece or you can pay a monthly fee and get all the artwork you want. Some are even free. Always check the terms and conditions carefully. You may not be able to use the stock art commercially. The other down side to stock is that your image could be used by some one else not giving you exclusive rights to the art. If that is the case, you may want to commission an artist to do your cover art. It will likely cost you (unless you are connected) and it will likely be more than the stock art sites. Relevant artwork. Artwork is important enough to get two bullet points (that I didn’t want to turn off my bullet point format). Make sure however you get artwork it is relevant to the story in some way. It should be eye catching as well. The artwork should not be overwhelming either. It is not an art gallery exhibit. Just enough to entice the readers to pick it up off the shelf. The sales-pitch. Typically this is on the back cover. Not seen right away. But you got the book off the shelf (or they clicked on the link). Now you need to get them to buy it. If you buy paper books like I do, the first thing I do after looking at the front cover, is turn the book over. This is where the author now has a chance to tell me why I should buy the story. Online they have a section for the Book description or synopsis. There could be whole blogs on how to write that. The main issue is you want to have a quick sales pitch about what your story is going to offer. And then, if you have them, some quotes for fairly well known (or just known) reviewers. This is your chance to get them to check out with your book. A poorly written sales-pitch will result in them putting the book down. Of course, they may also put the book down because the story isn’t what they like to read. That’s okay though. You’d rather have them not buy it then get it thinking it was something else and hate it (and possible tell a lot of people they hate it). Lets take a look at the cover of Shining in Crimson and The Nanotech Muders. Cover design by CL Stegall of Dark Red Press. Set in a dystopian, religiously-demented American Empire, the city of Las Vegas is no longer a city of sin. Now called Necropolis, it is a city that eats sin. The vampires of Necropolis wait patiently for the Empire’s weekly drop off of guilty Penitents; sinners and criminals full of fresh blood. The year is 2071 and there’s a serial killer loose in Atlanta. Lieutenant Jak Decker, a homicide cop, is on the case but is getting nowhere. As the body count mounts, his boss assigns him a partner, the smart and beautiful Detective Cassandra Smith. Decker, a tough, wise-cracking loner, doesn’t want a partner, especially when he finds out she’s an android. While I am no expert in Book Covers, I do understand that we judge books by their covers. If you want to sell some books cover art helps a lot (and it certainly doesn’t harm anything). We must also remember that your cover art will become that books brand. And we all know how powerful branding is. Just think about golden arches. So consider your cover art carefully. I can’t wait to get some cover art for my first novel. Please comment below with your cover art tips and tricks to help others learn from your own experience. Next Article Should Authors Write Book Reviews? Great post. Actually just downloaded Shining in Crimson a few days ago because of the cover. And the sales pitch is equally important. Just wrote a humorous post about that yesterday. I am glad you liked the post. I loved Shining in Crimson and I don’t like vampire stories. It is a good read. Hope you enjoy it. Richard, great post as usual. On the need for the artwork to be relevant to the story I would expand on this to add that it also needs to be very relevant to your target audience. If the book is fantasy, make sure the cover yells out, “FANTASY.” Same goes for any other genre, etc. Also, the cover should not be misleading. If the cover has something on it that sets up an expectation that the book either doesn’t deliver or is a misrepresentation of what’s inside in some way, it could severely turn off your reader before they even crack open the book. Just some thoughts. Again, awesome post! A good point as usual. A relevant cover art for the genre is important. You want to make sure it promises to be the genre the reader is looking for. It should also promise something of the story. Sorry you stumbled, I’ve been meaning to get that rug fixed. 🙂 I am glad you enjoyed the post and the blog. There is a fine line when writing the blurb. I just wrote my own, and there is a key element to the story that I want to mention in the blurb, but it appears thrown in when I add it. I’ve debated on if I need to even include it. I do like the blurb on Lee Gimenez’s “The Nanotech Murders”. I think it give just the hint of part of the story. Even gives a taste of the surprise, but once you read the book it becomes clear that while he has revealed a surprise, its not a give away of anything in the story. I am glad you came by the blog, I hope you enjoyed it. Plenty of articles to read.